On the Bright Side is a hilarious road to guardian angeldom paved with so much drama and due-paying that it makes middle school look painless. Instead of protecting Angela, Gabby pranks her (like tripping is a sin?) at the hopes of cooling off the new couple. At first, they seem harmless until the school dance sabotage gets completely out of control. Then, her Celestial Sky Agent, who happens to have anger management issues of his own, puts Gabby on probation, threatening her eternal future. Determined to right her wrongs, Gabby steals an ancient artifact that allows her to return to Earth for just one day. Without knowing, she kicks off a series of events and learns what can happen when you hate someone to death. 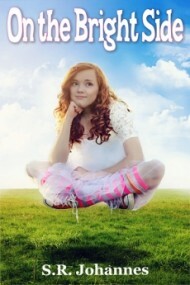 An unfortunate incident sends 14 year old Gabby to the afterlife WAY before she is ready. First thing on her afterlife journey.......witnessing her wake. Not only is she mortified that her mother dressed her in the worst, most non-flattering, white, pleated pants for all eternity, but her least favorite person in the whole world, Angela Black, shows up acting like she is a super model at a fashion show instead of a funeral. When Gabby finally lands in Cirrus, a place in Heaven, she realizes that things here are not what she expected. As a BIT (Bright in Training), Gabby is assigned to the grumpiest SKYagent in Cirrus. And he does not like or appreciate her sense of humor one little bit. BITs are given assigned mortals to protect as they learn the rules and procedures they must follow to work their way up to a full Bright. During the assigning ceremony, Gabby is horrified to hear that she is assigned to protect her frenemy, Angela Black. Not only is Angela a fencing rival from her living days, but she is also after her best friend and biggest crush, Michael. There is absolutely no way Gabby can protect the girl she hates the most! Following the rules proves to be a huge challenge for Gabby when it comes to protecting Angela. Sabotaging her relationship with Michael is her main goal and one she puts her heart and soul into. Especially after what she put Gabby through the night she died. A few little pranks never killed anyone right?? Gabby’s misbehaving ways put her, as well as her newest best friend, Jessica in a ton of danger and even more trouble. And the more trouble she gets in, the more evil is attracted to her. Will she be able to win her way back in the good graces of the Angels or will her latest plan land her in Ignitus for all eternity? On the Bright Side is a modern day twist on guardian angels. This book has a fun play on words that is very relatable to the here and now. It is a fun and easy read that I think will be a big hit. I am looking forward to reading more! Extremely relatable and great play on words! The concept was ok, but I found the story to be too slow. The book contained strong writing, but I saw with a few typos and grammatical issues.